Product prices and availability are accurate as of 2019-04-16 18:25:09 UTC and are subject to change. Any price and availability information displayed on http://www.amazon.com/ at the time of purchase will apply to the purchase of this product. 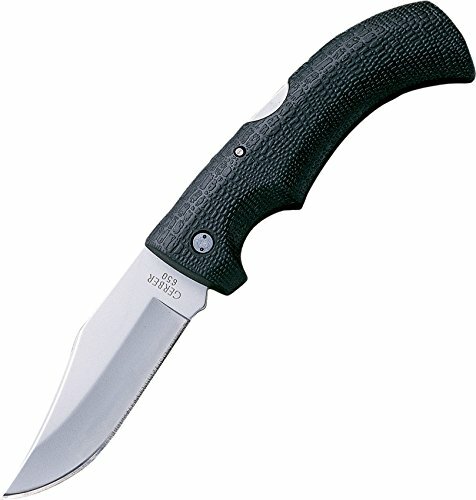 Gator, lightweight folding knife, 3-3/4" folding stainless blade, lightweight krayton handle, clip pt. With nylon sheath, fine edge, safety focused design features a lock back mechanism that keeps the blade securely in place while in use, 8.5" closed length, boxed. Loaded with high-end professional features, the Gerber 06069 Gator Folding Knife has a thermoplastic grip that mimics an alligator's skin texture to deliver an amazingly secure, reliable, and comfortable hold. This folding knife with a fine edge and clip point can withstand any kind of weather, no matter how harsh, making it ideal for the outdoor enthusiast. The durable stainless steel blade and ultra-grip material make this knife perfect for everyday use. View larger. 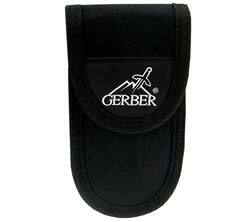 Keep your Gator Folder safe and secure in this durable nylon sheath. View larger. Like alligators, the Gator Folder is completely indifferent to the weather--it performs to its fullest whether it's wet or dry. This recipient of the 1991 Blade Show winner for "Most Innovative Knife of the Year" continues to impress by consistently delivering top-notch performance when it comes to even the toughest cutting jobs. The Gator Folder employs advanced thermoplastics and features a glass filled nylon handle with an alligator skin texture to provide an incredibly reliable, supremely comfortable grip. The feel of the reptile scales keeps your grip secure, whether you're hunting, rock climbing, camping, or fishing. Built to be rugged, the Gator Folder boasts a durable 420HC stainless steel blade and a dependable lock-back mechanism for safety. For added convenience, the knife arrives with a sturdy nylon sheath. And with a length 8.5 inches, blade length of 3.76 inches, and a weight of 5.4 ounces, the Gator Folder is compact enough to toss into a bag or backpack or to slip into your pocket, so it's easily accessible when you need it. The Gator Folder is backed by a limited lifetime warranty. 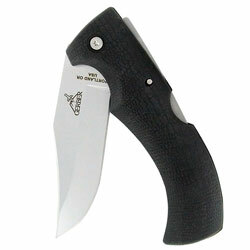 Gator Fine Point Folding Knife and nylon sheath.